On 24 October, the draw for the 2013 Africa Cup of Nations was made in Durban. This tournament will be, among other things, the first since 1965 to be held in an odd year – CAF (the African federation) have changed the tournament to odd years going forward to avoid clashes with World Cups in particular. South Africa is hosting the 2013 tournament after Libya ducked out due to its minor ongoing internal political issues. 5 of the stadia used at the last World Cup will be used in this tournament, including 2 of the most white-elephanty in Nelspruit and Rustenburg. Durban, Port Elizabeth and Johannesburg will be the other host cities for the tournament. The draw has pulled out some intriguing clashes. Regular readers (if there are any) of this blog will be aware that Cape Verde have qualified for the tournament for the first time; they will play the opening match of the tournament on 19 January against South Africa at the gargantuan Soccer City. Given the Blue Sharks’ wonderful performances in qualifying for the tournament (beating Cameroon 2-0 in Praia being the obvious highlight), I fancy them for a shock result or two in Group A, where they sit with South Africa, fellow former Portguese colonists Angola and an ever unpredictable Morocco. That said, South Africa and Morocco should be the strongest sides in this group (Morocco certainly looked decent at the Olympics). Moving away from footblawl’s undoubted Cape Verde bias, Group B has two obvious qualifiers for the last 8 in Ghana and Mali. Niger will be rank outsiders though are capable of a shock (their mere qualification for two successive tournaments is a shock in itself), while Democratic Republic of Congo (Zaire if you’re feeling retro) will fancy their chances of nicking a point here or there against the big guns in their first finals since 2006. Group C contains reigning champions Zambia, returning giants Nigeria, returning sleeping giants Ethiopia (in their first Cup of Nations since 1982) and Burkina Faso. The obvious two should qualify here though I think Zambia could have a tougher time of it – their performances in qualifying for this tournament (needing penalties to get past Bobby Williamson’s Uganda in particular) don’t bode well. Group D is undoubtedly the toughest of the four and the one where probably the most quality resides. Perennial runners up Ivory Coast will have one last shot at winning Didier Drogba an international medal (of the right hue), Tunisia return to the tournament after their Arab-Spring-related break in 2012 while fellow northerners Algeria also have quality in their squad. Probably the best story in this group is the return to competition of Togo, after their tragic appearance at the 2010 competition in Angola. Outrageously banned by CAF after refusing to play on having had their team bus attacked by Angolan rebels (the ban was subsequently and mercifully dropped), the chaps from the northwest return to the tournament in good spirits and with Emmanuel Adebayor back in the fray. Trying to pick a winner out of those 16 is not easy. Nigeria have impressed in the ease with which they qualified and they have the likes of Victor Moses and team-mate John Obi Mikel to call on. Ivory Coast, as I allude to above, will fancy a last hurrah for the more ageing of their star players (the aforementioned Mr Drogba in particular), while Zambia and their charismatic coach Herve Renard will no doubt, if they get through their tricky group, fancy putting another unlikely run to the final together. It’s also worth pointing out that the last time South Africa hosted this tournament, in 1994, they won it. What is certain is that the profile of the Cup of Nations, and of African football in general, is increasing and improving all the time. A successful Cup of Nations with entertaining and athletic football on show will only increase that profile further, and galvanise the claim that the Cup of Nations is the second strongest of the major continental tournaments. I am also tempted to invest in a Cape Verde shirt… but that might be a step too far. 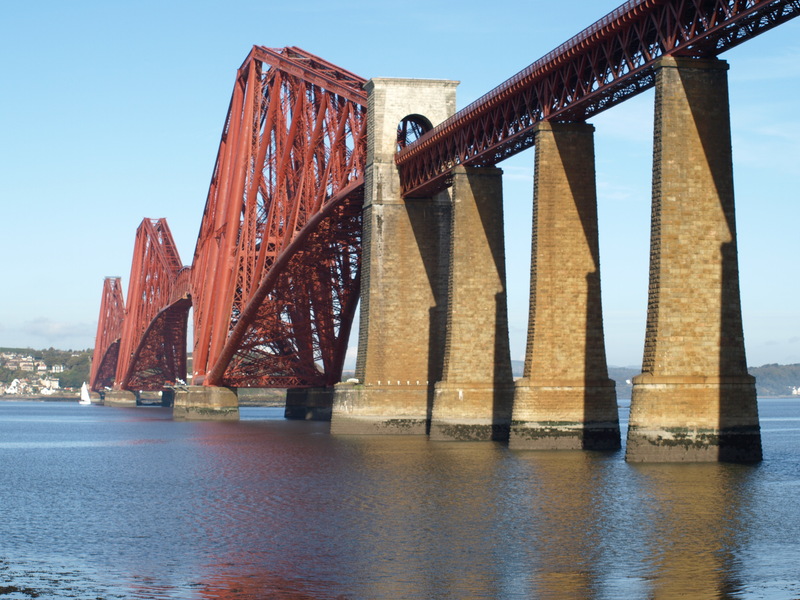 A large, red, Victorian era railway bridge, yesterday. This post is completely and utterly off my usual topic of complaining about football, but something I thought worth mentioning. 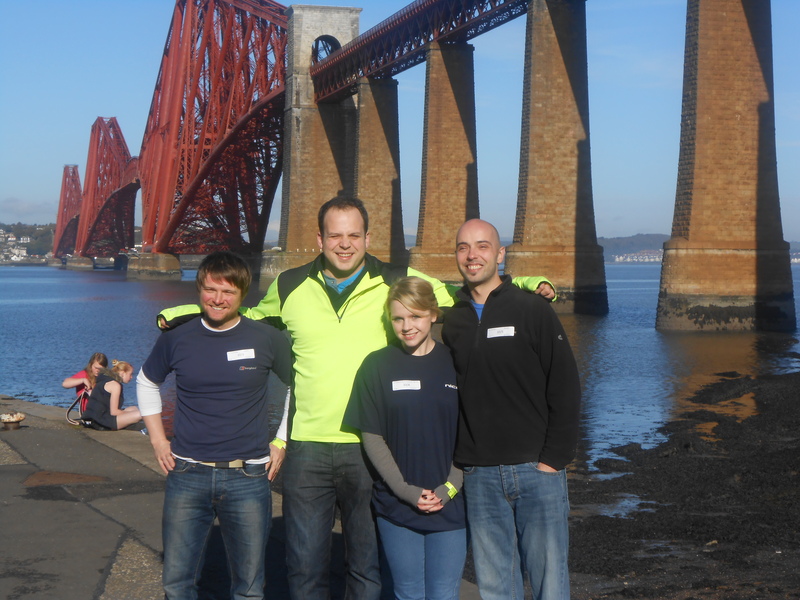 Yesterday, myself and four cohorts abseiled off the Forth (Rail) Bridge for charity, a full 165ft onto the beach at South Queensferry. We were doing this for a charity called nico35, which was set up by a colleague of mine (Nick Stormonth) after he was diagnosed with terminal cancer. Nick sadly passed away at the start of September and is much missed by friends, family and colleagues alike. We have already raised at least £1,000 between the five of us (and that’s a conservative estimate) – if anyone would like to donate more to the cause, please check the nico35 website for further information on how to donate. 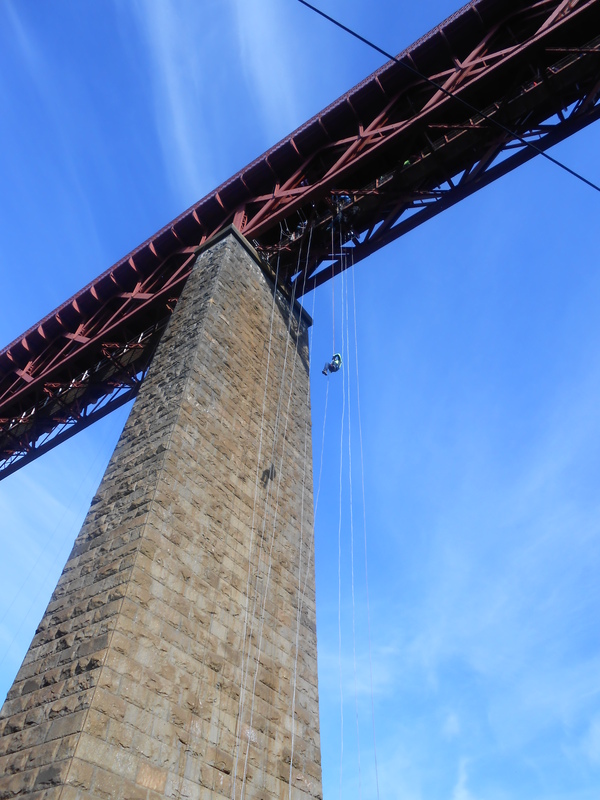 As for the abseil itself, it was quite an experience. Probably the worst bit was climbing over the little fence on the walkway and being told “yeah just climb onto that beam over there.” Luckily the bloke connecting me up to the ropes was also called Graeme (right spelling as well) so I knew I was in safe hands. Once I was on the wee beam, it was a case of being told to sit in the harness… and go down. Finally, in my view you can never have enough charity links in a blog post, so here’s another – get yourselves over to www.nico35.co.uk and please give generously to a fantastic cause. 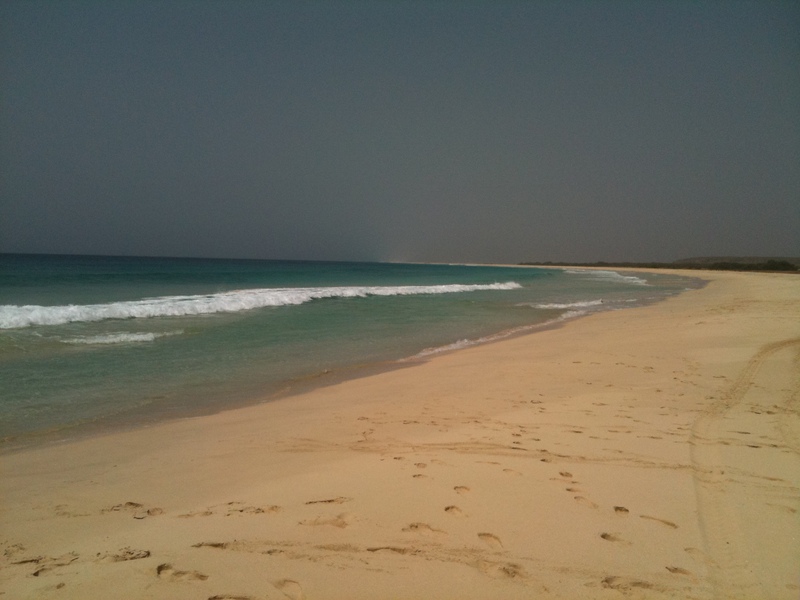 Another typical Cape Verdean scene. On the A1 this afternoon, somewhere around Fort Kinnaird on the outskirts of Edinburgh, while it was hammering it down with rain, I received what for me was definitely the best sporting news of the weekend. After watching Scotland’s World Cup qualifying campaign almost certainly end on Friday night, the lack of anything much interesting on Saturday and Andy Murray’s mishaps against Novak Djokovic this morning, the news came through via the BBC website’s excellent coverage – Cape Verde had qualified for the 2013 Africa Cup of Nations. Having holidayed there last year and absolutely loved the country and its people, I have followed the fortunes of their national football team since, including last month’s incredible 2-0 win at home to Cameroon, the first leg of their two-legged final qualifier for next year’s tournament. Prior to the second leg, the hype had been all about the return of Samuel Eto’o to the side, the President of Cameroon himself having been among those who persuaded Eto’o to end his self-imposed, Roy Keane-esque exile after criticising the “amateurish” preparation for the first leg in Praia. Cape Verde, I had feared, might suffer from a Cameroon side playing at home with their one world-class player back in the side, and a new manager sitting on the bench. Surely a two goal deficit would be easy for the Indomitable Lions to overcome in front of the baying Yaounde crowd. As it was, the Blue Sharks from the former Portuguese colony took the lead on 22 minutes, with a free kick from Heldon Ramos of Maritimo. 3 down with an away goal against them was simply too much for Cameroon to come back from. Achille Emana bagged an equaliser for the home side 10 minutes later, but Cameroon didn’t score again until the final, vaguely-glowing embers of the match, youngster Fabrice Olinga finding the net in the fourth minute of stoppage time. A 2-1 win on the day was nowhere near enough for the Indomitable Lions as Cape Verde advanced to their first ever Africa Cup of Nations finals tournament 3-2 on aggregate. Cape Verde have thus created a little bit of history for themselves. A country with a population of little over half a million, but with a wide diaspora across Europe, particularly in former colonial masters Portugal, have beaten African footballing royalty to reach their first major international tournament. 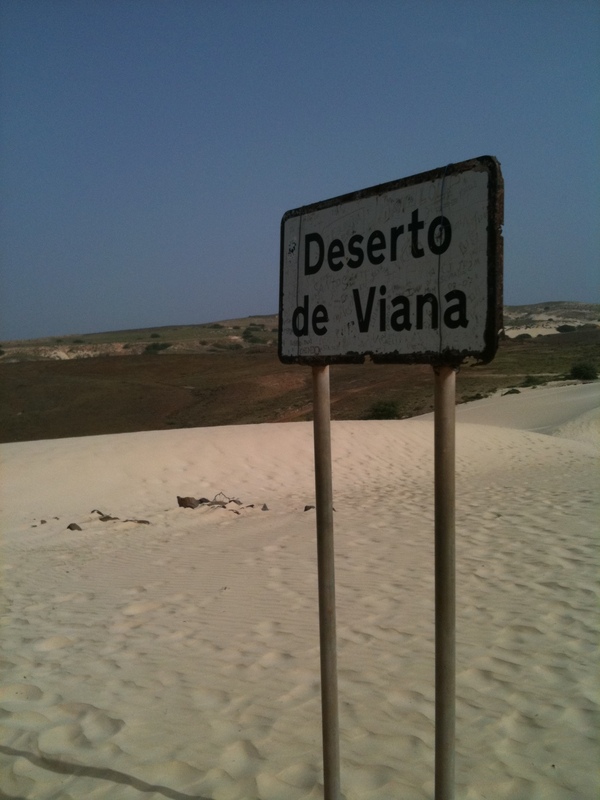 Having watched them (admittedly only on the TV) come so close to qualification last year while I was on holiday, I am thoroughly delighted for each of those 500,000 Cape Verdeans who will no doubt currently be partying on the streets of Praia, Sal Rei and Mindelo. Roll on the draw on 24 October, and then the Cup of Nations itself which begins in Johannesburg on 19 January 2013. The flag of a first-time Africa Cup of Nations qualifer.